Prosperous jute merchant, jute and flax auctioneer, and art collector and dealer. 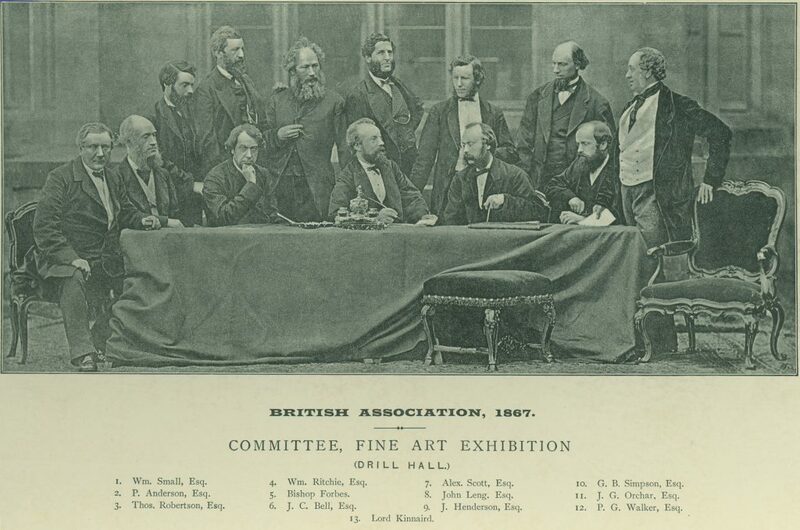 Committee member of Victoria Art Galleries from 1877 and noted patron of Scottish artists of the period. 1 Hunter Place, Monifieth Road, Broughty Ferry, 1869-1879. 4 Douglas Terrace, West Ferry, 1880-1897. Auctioneer, commission merchant, and agent. Successful jute merchant, who added auctioning of jute and flax to his business. 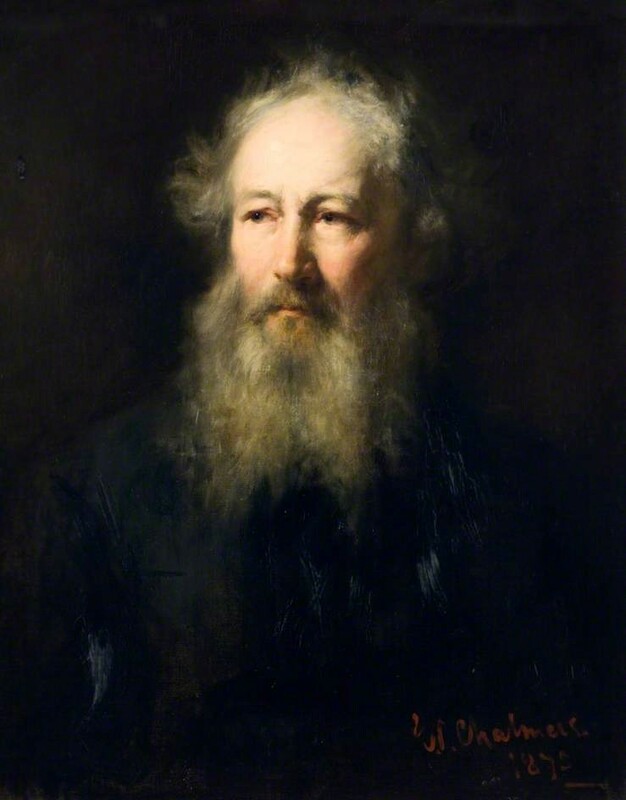 He developed a great interest in art and built up a substantial collection by Scottish artists, many of which he later sold for a considerable profit. 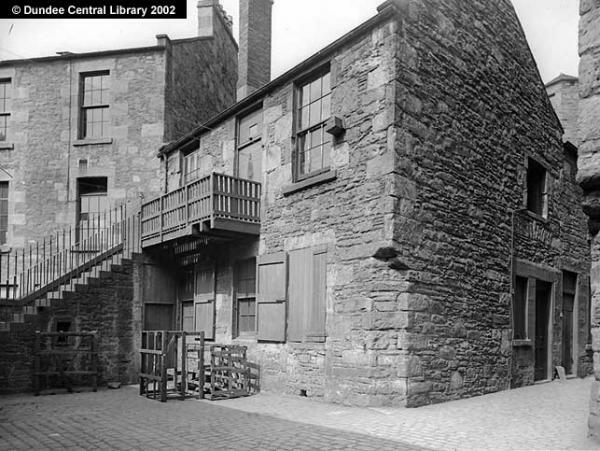 “…started business as a jute merchant in the city (Dundee), and to this department of his mercantile dealings he afterwards added the business of auctioneer, confining himself to the selling of flax and jute. In both spheres he was very successful, and in his capacity as an auctioneer he soon came to be recognised as the principal representative for the flax and jute trade. In his day there were far more auction sales in the city than there are at present (1897), particularly on account of the damage done to flax on transit from Russia to this country. At that time all the flax came in sailing vessels, and in almost every vessel there was more or less damage, the material being thus invariably sold by auction. …During the time that he was in business Mr Bell was a constant frequenter of the Exchange, and in connection, with his business relations he was held in the highest respect. After an honourable career he retired from business twenty years ago. It is, however, as an art student that Mr Bell will be best remembered. 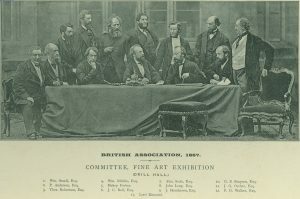 Not only was he one of the most ardent collectors of the best pictures, but he did much to foster a love for art, and took a leading part in the management of all the Dundee Fine Art Exhibitions. Almost fifty years have elapsed since Mr Bell bought his first fine picture. About that time the trade of Dundee was expanding, and many were then able to devote more attention to spending their wealth on art. Mr Bell was one of the first who gave attention to the subject, and in his case his zeal for becoming the possessor of an art collection was modified by a good discriminating knowledge. As a matter of fact, he had learned by experience. About 1860 when the great outburst of Scottish artistic genius took place, Mr Bell had a comparatively important collection. At that time Robert Scott Lauder was at the head of the Life School of the Royal Scottish Academy, and he had as pupils Orchardson, Pettie, McTaggart, Peter Graham, Hugh Cameron, McWhirter, Lockhart, Hutcheson, and others. Mr Bell was one of the first in Scotland to realise the, significance of the new manifestation, and he soon became one of its most liberal patrons, and a warm friend of the members. From the fact that he took such a warm interest in the new movement and the encouragement which he extended to the artists, never attempting to cheapen the price which they sought to obtain for their work, the latter strove to give him the very cream of their talent, and it was in this way that Mr Bell’s grand collection was formed, for, as a matter of fact, he in his day had really brought together three collections. Mr Bell’s first collection was dispersed in Edinburgh in 1878, and the sale created extraordinary interest in art circles. For one thing, it contained many of the choicest examples, and the result of the sale was eminently successful, the amount realised being £7500 (nominal value at 2018: Relative to income – £6,000,000). Indeed, it is questionable if this amount has ever before or since been obtained at an art sale in Scotland. Amongst the pictures sold were specimens of Erskine Nicoll, Fraser, and McTaggart, and the prices obtained for them caused quite a sensation as much as from £200 to £400 (nominal value at 2018: Relative to income – £160,000 to £320,000) being realised for single specimens, although some years before they could have been obtained at from £40 to £50 (nominal value at 2018: Relative to income – £32,000 to £40,000). Mr Bell continued to collect after this, and in 1890 he decided upon a second sale, which realised as much as £3500 (nominal value at 2018: Relative to income – £2,800,000). Until the time of his death Mr Bell was an art connoisseur, and his latest collection contained valuable specimens of J. L. Wingate, W. D. McKay, John A. Reid, David Farquharson, and others. It may be mentioned that Mr Bell, amongst his other gifts, had the real distinctive power of detecting merit in young artists. Mr Bell had no desire for municipal honours, and, as a matter of fact, he took no part in public affairs. In his younger days he took a very warm interest in volunteers, and indeed was for many years an officer in one of the local regiments. He was a Justice of Peace for Forfarshire for many years, and in this capacity, he was one of those who gave much of his time to the discharge of the duties. In January 2018, within the McManus: Dundee’s Art Gallery and Museum, and during the “Revealing Characters” Exhibition, the aforementioned portrait hung alongside an earlier portrait of John Charles Bell, again by George Paul Chalmers, R.S.A. Eleanor Bell (sister); Madeline Ann Bell or Robertson (sister); Patrick Stewart Sandeman (brother-in-law). Northumberland and Durham Baptisms - Berwick-upon-Tweed, 1817. FindMyPast website. Dundee Courier, Thursday, 26 August 1897 p.5. British Newspaper Archive website. Statutory Registers. Dundee. Death. 25 August 1897. 282/4 845. ScotlandsPeople website. Dundee Directories 1856-1868. Local Studies, Central Library, Dundee and Dundee Valuation Roll, 1865. VR008800018. ScotlandsPeople website. Dundee Directories 1869-1879.Local Studies, Central Library, Dundee. Dundee Directory 1880-81, p.533. Local Studies, Central Library, Dundee. Dundee Courier, 27 August 1897, p.8. British Newspaper Archive website. Dundee Courier and Argus, 9 July 1863. British Newspaper Archive website. Wills and Testaments. Dundee Sheriff Court. SC45/31/50 pp.203-205. ScotlandsPeople website. Dundee Directory, 1867-68, p.99. Local Studies, Central Library, Dundee. Dundee Directories 1846-1870. Local Studies, Central Library, Dundee. Dundee, Perth and Cupar Advertiser, 15 January 1850. British Newspaper Archive website. Dundee Directory, 1850, p.vii. Local Studies, Central Library, Dundee. Dundee Courier, 10 September 1897 p.4. British Newspaper Archive website. Dundee Evening Telegraph, 4 April 1928, p.6. British Newspaper Archive website. Dundee Advertiser, 1 October 1897. British Newspaper Archive website. The staff of Local History, Central Library Dundee. The information above about John Charles Bell has been collated from a range of digital and hard copy sources. To the best of our knowledge it is correct but if you are relying on any information from our website for the purpose of your own research we would advise you to follow up the sources to your own satisfaction. If you are aware of an inaccuracy in our text please do not hesitate to notify us through our Contact page.